Space shuttle Endeavour, seen here in 2011, will trade its NASA hangar (above) for an airliner's before arriving inside the Samuel Oschin Display Pavilion at the California Science Center in Los Angeles. 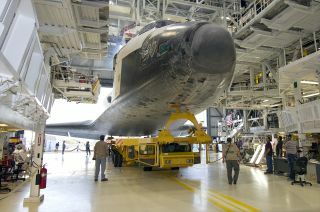 When NASA's space shuttle Endeavour lands in Los Angeles in September, it will call a United Airlines hangar home before parading through the city’s streets to the California Science Center. Endeavour, once it is moved into the center’s new shuttle-dedicated hangar, will be reunited with one of its missions' larger payloads, the commercial logistics module that flew with NASA's first educator astronaut to the International Space Station. The "Samuel Oschin Space Shuttle Endeavour Display Pavilion" at the California Science Center is set to open this fall to showcase the youngest of NASA's now-retired orbiters, as well as the Spacehab module that it carried. The climate-controlled hangar, which began rising from a plot of land northwest of the center's main facility in March, is named for the late Samuel Oschin, an entrepreneur, explorer, and philanthropist whose family foundation made a significant donation toward Endeavour's display this past May. Endeavour will be flown from NASA's Kennedy Space Center in Florida to the west coast on top of the space agency's Boeing 747 shuttle carrier aircraft (SCA). The dates of that flight are still being worked out, museum officials said. After its cross-country trip, Endeavour will touch down at Los Angeles International Airport (LAX), the landing strip closest to the science center, with a runway long enough to accommodate NASA's jumbo jetand space shuttle duo. From there, it will be brought over to its temporary home, an aircraft hangar on loan from United Airlines. "United Airlines has generously donated use of a hangar and their ramp space outside the hangar for NASA's use in the removal of Endeavour from the SCA  and other necessary work to prepare for transport to the Science Center," Rudolph said. Outside the hangar, NASA will use two large cranes to hoist Endeavour off its 747 carrier jet and onto a wheeled transporter, the same device used to move space shuttlesoverland from the Palmdale, Calif. plant where they were first assembled and underwent periodic upgrades to the Dryden Flight Research Center at Edwards Air Force Base to be ferried back to Florida. A couple of weeks later in mid-October, Endeavour will be slowly towed through the streets of Los Angeles, crossing the 13 miles (21 kilometers) separating the airport and the science center. The route has been carefully planned to take into account the need to temporarily remove trees, traffic signals and other obstacles that are within reach of the shuttle's 78-foot (24-meter) wingspan. Endeavour, inside the Oschin Pavilion, will be displayed on its overland transporter. The horizontal exhibit will be enhanced by photos and other artifacts to help share the orbiter's story. The Spacehab Logistics Single Module that flew inside Endeavour's payload bay will be among the related objects on display. The 10-foot-long by 14-foot-wide by 11-foot-high (3 by 4.3 by 3.4 meters) pressurized aluminum habitat was aboard Endeavour for its STS-118 mission in August 2007. The space station-bound flight was led by Scott Kelly, the twin brother of Endeavour's final commander, Mark Kelly. The STS-118 crew included Barbara Morgan, NASA's first educator astronaut and the original backup crewmember to the agency's "Teacher in Space," Christa McAuliffe, who was lost during the space shuttle Challenger tragedy in January 1986. "Astrotech has generously donated the Spacehab module for display," Rudolph told collectSPACE. "It will initially be displayed adjacent to Endeavour in the Samuel Oschin Space Shuttle Endeavour Display Pavilion." The module, together with another Spacehab extension, will later be integrated into the CSC's permanent home for Endeavour, the Samuel Oschin Air and Space Center, which will be developed over the next five years. That exhibition will display the shuttle vertically. To complete the launch pad diorama, Endeavour will be paired with solid rocket boosters and an external tank (ET). Originally, both components were to come from the Kennedy Space Center Visitor Complex, but the CSC ultimately chose to take only the twin side rockets. "After our engineers' review of the ET, it was determined that its current condition was not suitable for supporting the orbiter safely," Rudolph explained. "We will fabricate a replica for the vertical display." Still, the tank at Kennedy, an original test article, won't go to waste. NASA has awarded the ET to the Wings of Dreams Aviation Museum, located at Keystone Heights Airport in central Florida. Follow collectSPACE on Facebook and Twitter @collectSPACEand editor Robert Pearlman @robertpearlman. Copyright 2012 collectSPACE.com. All rights reserved.